Friedestrom Park, which has been newly laid out within the walls of the old castle of Zons and around Zons museum, makes numerous references to the museum collections in its conscious selection of particular plants and trees. In front of the museum entrance, trimmed cushions shaped from plants form a space surrounded by golden rain trees. The newly-constructed belvedere, which is sheltered by two mighty, large-leaved linden trees, offers visitors a sweeping view over the old riverbed of the Rhine. The “Garden of Defensibility” is geometrical in design and is planted with trimmed hedges of European beech which continue the line of the moat walls. Four apple trees fan out over the small garden with their spreading crowns. The roof of an old bunker has been converted into a terrace giving visitors a view of the park. Many different plants such as clematis, wisteria, hydrangeas, lunaria, forget-me-nots, bleeding heart, azaleas, blue comfrey, viburnum and flowering bulbs can be found at the edge of the castle moat. Old trees such as sycamore maple, sweet chestnut, Norway maple and large-leaved linden trees create an old-world atmosphere in the rear park, which is surrounded by fortified castle walls. „Designing a garden means creating a space“ – – landscape architect Bernhard Korte was inspired by the history of the location when designing Friedestrom Park. 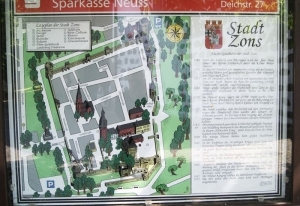 Laid out around Zons district museum and opened in 2011, Friedestrom-Park makes numerous references to the museum collections in its conscious selection of particular herbaceous shrubs, bushes and trees. „The museum is embedded in a newly designed park, the vegetation of which corresponds in a special way to the museum collections. Art nouveau – including pewter art nouveau – was an artistic genre which encompassed every sphere of activity. One of its elements was the widespread adoption of traditional shapes from the Eastern Asian region. Koelreuteria (golden rain tree) is a genus of trees from Eastern Asia which today grace the forecourt of the museum and allude to this connection. The space in front of the museum has been planted with trimmed cushions of European beech and laid out with benches and flags. It forms a reception area surrounded by golden rain trees. Botanically known asKoelreuteria, the trees originally come from Eastern Asia. Garden design’s long-standing tradition of using exotic plants adds a particular aesthetic appeal here. Golden rain trees flower until well into late summer, the yellow panicle blossoms being succeeded by red foliage and lantern-like seed pods in autumn. Yellow lady’s mantle, blue lilac and hostas complete the picture in spring. Sheltered by two mighty, large-leaved linden trees, the newly-constructed belvedere is located directly at the old castle wall on a raised area behind an iron gate. This raised position enables visitors to get a sweeping view of the Rhine floodplains and the old river bed. A bench in the shade provided by the trees invites visitors to linger meditatively. The “Garden of Defensibility” and the bunker terrace are dedicated to the location’s history. The geometrical garden is dominated by trimmed hedges of European beech flanked by four apple trees (Jacob Fischer), an old species from the period around 1903. A small flight of steps leads down to the sunny bunker terrace paved with flagstones of basalt lava from the Eifel region. 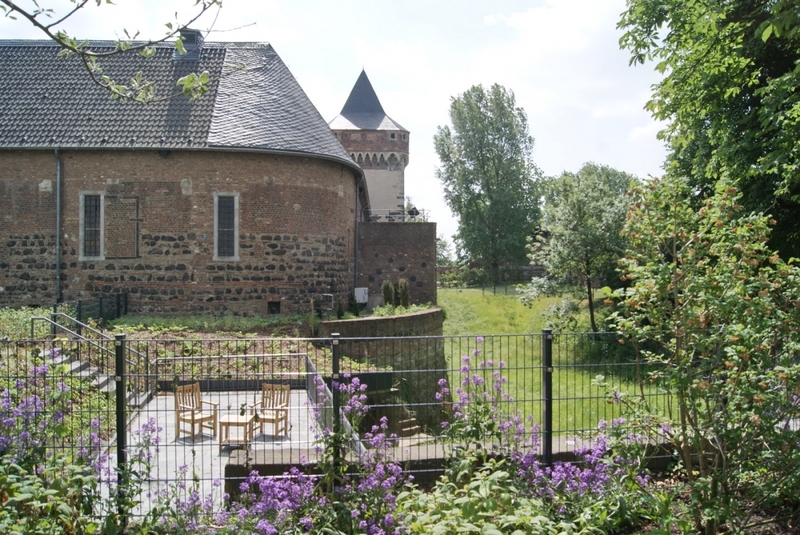 From here visitors have a sweeping view of the castle moat with its wild herbs as well as of the historical and modern museum buildings of glass and steel. At the edge of the large lawn, many different plants grow along the deep castle moat in the shade of the horse chestnuts and European beeches as well as in the sunny spots. These include hostas, clematis, wisteria, hydrangeas, rhododendrons, lunaria, forget-me-nots, bleeding heart, azaleas, blue comfrey, viburnum and flowering bulbs. Old and newly planted trees dominate the rear park and its extensive areas of grass, among them European and copper beech, Emperor’s linden trees, robinia, Norway and sycamore maple, sweet chestnut, ash, gingko and rowan. 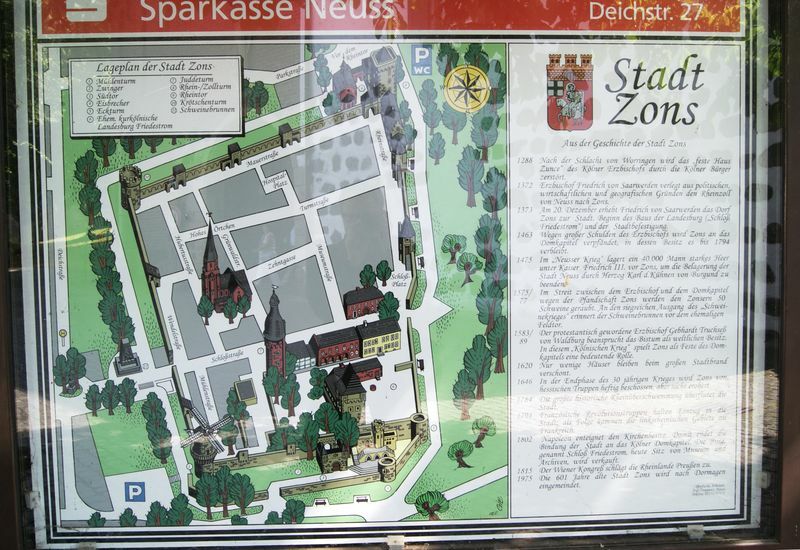 Surrounded by fortified castle walls, wooden benches in shady and sunny spots invite visitors to linger and relax. Crocuses, winter aconite and snowdrops are the first harbingers of spring in the park at the beginning of the year. The north and south gates of the medieval castle are connected by a broad, dry-grass gravel path which is home to resilient, undemanding plants such as yarrow, sandwort, daisies, bedstraw, black medic, marjoram, pinks and long-headed poppies. All of these plants thrive and flower here even in extreme soil conditions and at extreme temperatures. Visitors can gain access to the archive courtyard, which is highlighted by two empress trees (Paulownia tomentosa) by passing through the immense gate tower, a structure which still awaits restoration. The outline of two old churches from the 11th and 13th centuries can still be seen in the paving. Existing plants on the old castle wall such as common bugloss have been retained. The park is only accessible from the museum. Accessibility: The main paths are suitable for visitors with reduced mobility. Events for children: yes, see www.kreismuseumzons.de for details . Dogs: Dogs are to be kept on short leash. Use your poop scoop.